As the U.S. Permanent Representative to the United Nations, Susan Rice read a eulogy she prepared on the occasion of the death of Meles Zenawi, the prime minister of Ethiopia, she called him a “tough, unsentimental and sometimes unyielding,” leader. 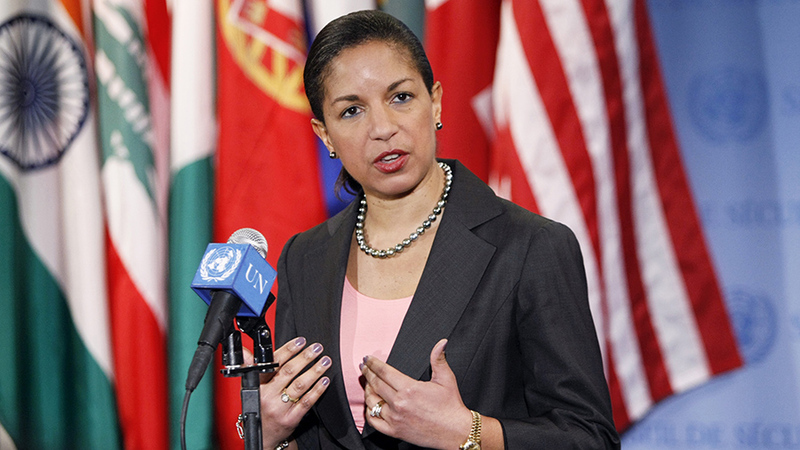 She went on to describe how he demeaned people who disagreed with him saying, “of course, he had little patience for fools, or idiots, as he liked to call them.” Rice was speaking about a leader with a legacy tarnished due to his decision to quash dissent, preside over security services that opened fire on protesters during a disputed 2005 election, imprisoned journalists using the fig leaf of terrorism, used food aid as a political tool and stole land in south Ethiopia. That is but a short list of his many crimes. 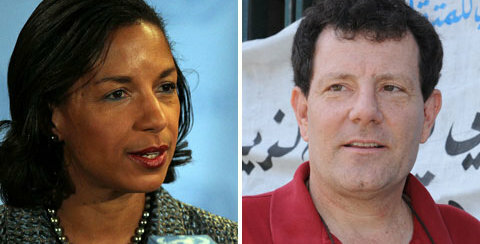 Rice chose to talk of him as a hero and a leader that will be missed for his contributions as a human rights advocate. To call this eulogy naive is to ignore Rice’s history of codling dictators in the region and her track record fundamentally misunderstanding the politics and people of the African continent. This dates back to the early days of the Clinton presidency and continued when Rice served as the U.S. Assistant Secretary of State for African Affairs from 1997-2001. Presidents in the horn at the time were dubbed the “new generation of African leaders” following Clinton’s trip to Africa in 1998. One of the many hapless policies selectively applied in the region and which continues to this day. During his travel Clinton hailed a group of leaders specifically in the horn which includes Yoweri Museveni of Uganda, Paul Kagame of Rwanda, Meles Zenawi of Ethiopia and Isaias Afwerki of Eritrea. All of the presidents except for Meles are still clinging to power 14 years later. But Meles, the leader Rice called “a true friend to me” during the eulogy, gives observers a window onto someone easily charmed by Africa’s dictators. Ethiopia’s late prime-minister has used the country’s economic success to avoid criticism for terrible human rights record and he died while after consolidating power and crushing dissent for 21 years. It is such double standard rooted within the fiber of the relationships formed by the ambassador and which later plays out during Susan Rice’s role in mediating the Eritrea and Ethiopia border demarcation process what drives me to write this blog entry. Rice played a role in the Eritrea-Ethiopia peace process as U.S. Assistant Secretary of State for African Affairs, a process which could have averted a decade-long stalemate that has followed. But unfortunately, she and Jendayi Frazer failed to deliver fair judgement for millions of people who are still held “hostage” as some officials call the militarized circumstance on the ground, due to a no war no peace situation between the two countries. To be clear, Rice and others were not obligated to make the two sides come to an agreement, but they should have used their significant influence over Ethiopia to make the country go along with the “final and binding” decision of the boundary commission. A series of WikiLeaks documents shed light on the private decision process Rice used when considering the Eritrea-Ethiopia conflict. “ Mr. Kristof, thank you for this opportunity! I am a concerned Eritrean-American who is worried about the threat to the sovereignty of Eritrea. Why was the world silent when Ethiopia attacked Eritrea in March 2012? It needs to be noted that despite this legitimate threat, Eritrea has shown a commendable self-restraint. But we are left wondering, why the UN is taking its time to act? Last time the two countries were at war, over 70,000 people were killed within the span of 3 years from 1998-2000. Isn’t that a lesson to learn from? Eritreans are still waiting for an answer. I would also like to briefly look at sanctions imposed on Eritrea by the United Nation’s Security Council with Susan Rice leading and pushing for measures behind closed doors. While the stalemate between the two countries has lingered for over a decade and counting, Susan Rice has moved on and continues to partner with her friends in the region despite their human right abuse records. Unfortunately, it’s hard to vouch for the innocence of an Eritrean government which lacks transparency and regularly flaunts international norms and imprisons dissenters. But even with incriminating evidence plastered all over the security report, footnotes tell an interesting story. The evidence used to implicate the country came from statements taken from soldiers who were under Ethiopian captivity, names such as Colonel Gemachew Ayana (Clearly not Eritrean name but Ethiopian) who was allegedly training the OLF in Eritrea and many other statements from highly suspicious sources. Bias when collecting intelligence to identify actual wrongdoing has been a pattern for the monitoring group which has given conflicting reports from time to time. It may not be fair to say that Rice was directly doing the bidding of Meles, but it appears from all publicly available documents that the information she received and her perspective has been seriously one-sided. Unfortunately here in America, leaders are obsessing over an issue that the ambassador had little role in. A pre-emptive opposition by John McCain, R-Ariz., and Lindsey Graham, R-S.C., to block the possible nomination of Susan Rice to the position of Secretary of State. In fact, the effort to block Rice’s appointment gained traction after a letter from a group of 97 House Republicans backed the claim that Rice, currently the U.S. Ambassador to the U.N., is not fit to take over the role as the U.S. Secretary of State. The missive accuses her of “either willfully or incompetently” misleading the American public based on comments she made on a series of Sunday TV talk shows five days after the Benghazi attack in Libya. In an effort to curry favor, Rice made a trip to capitol hill to meet with skeptical lawmakers last week. That trip appears to have gained her little ground with several senators making public statements that they were even more skeptical about Rice’s nomination after meeting with her. The hostility toward her is centered on her statements that the September 11, 2012 attacks on the U.S. consulate in Libya that ended in the death of U.S. Ambassador J. Christopher Stevens and three other Americans was a result of an anti-Muslim video. This view has since been discredited. But where did the ambassador get the information from? The intelligence community including members of the NSA, CIA and FBI gave her the talking points she recited on a television show. It defies common sense that the blame goes to the person who conveyed messages drawn up by the country’s intelligence. As the political posturing continues, the fixation of the GOP on the Benghazi issue is worrisome because it is as if they are acting as enemy combatants within government for something that has zero relevance and link with the Ambassador’s actual body of work in her career. If there is genuine opposition to Rice, let it be for her misinformed or miscalculated decision making. Let it be for the ambassador’s time in the Clinton administration that should be scrutinized. A series of failures including a failure to intervene in the conflict in the Democratic Republic of the Congo in a war deadlier than the Rwandan genocide which has claimed 5.4 million deaths. Let us also recall that Rice was against any intervention to halt the genocide in Rwanda and instead was busy making political and election-based calculations according to a history of the conflict written by Samantha Power. The bottom line is this: it should be Rice’s complete body of work that makes her unqualified to become the next Secretary of State. The Benghazi bungle is only a footnote.